Some trends were predictable. For example, the mid-Atlantic is obsessed with seafood, with Maryland and Delaware users saving ideas for “scallops” and “crabs,” respectively. Chiles were popular in Arizona, and New Mexico residents craved empanadas. In Illinois, Louisiana, and Tennessee, users pinned regional favorites like wild rice soup, shrimp pasta, and cornbread, respectively. And in wild Alaska, residents saved search results for “survival bread,” otherwise known as hard tack, pilot bread, ship biscuit, or sea bread. Other states had surprises up their sleeves (or should we say, in their ovens and pantries): For example, Georgia is the birthplace of Coca-Cola, but Arkansas users were the ones pinning ideas for the soft drink, and Pennsylvania users inexplicably saved recipes involving peach schnapps. 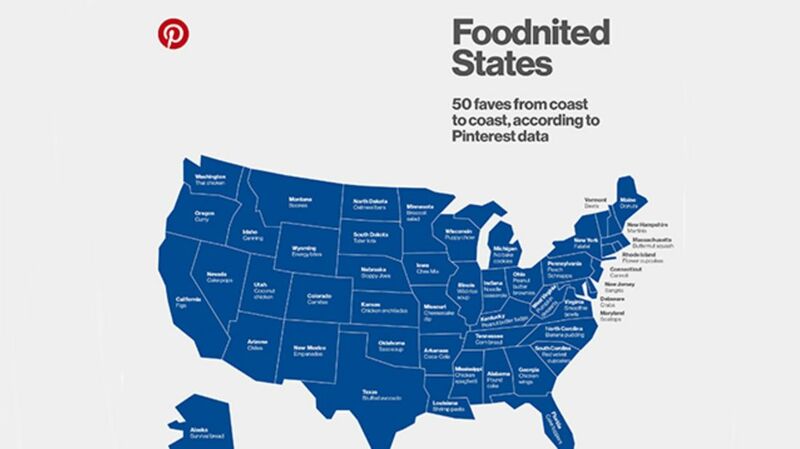 Click on the map below to see your state’s top food/drink pick, or visit Pinterest’s blog for links to recipes inspired by their findings.